Vintage and antique earrings might be different, but they also have a lot in common. In fact, one of the biggest distinguishing characteristics of an antique earring vs. a vintage earring is the difference of about 50-100 years. Modern or “vintage” earrings were more prominently created and popular between the Art Deco (see below) era to the current period in which we live in today. 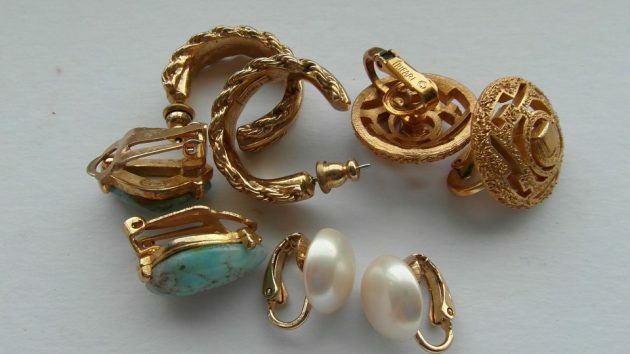 Before diving deeper into the history of and comparing vintage to antique earrings, it’s important to understand the term “estate jewellery”. Estate jewellery is considered to be antique jewellery that at one point was owned by another person or family. Whether the earrings were passed down or sold on doesn’t matter, both retain the classification of being considered “estate jewellery”. Classified by a European origination, estate jewellery has evolved over the years as far back as the rare Georgian era or 1700’s. The Georgian times influenced jewellery, especially the most popular and valuable, (antique) estate jewellery. The earrings and other pieces from this time period are almost all handmade, and include both natural designs such as flowers and leaves, as well as various soft, precious stones and metals like 18k yellow gold. These were brought over to Northern America through settlers and traders, much like happened in the other eras to follow. The Early Victorian Romantic era of antique earrings was influenced by natural designs and often included gold trims, and varying sizes, clarity, and quality diamonds – and occasionally coloured gemstones. Most often, similar to the Middle Victorian Grand Era, this kind of jewellery was commonly found in lockets, brooches, and occasionally earrings – although these were comparably rare during this period. The Middle Victorian Grand era brought forward extremely popular antique earrings which were made with precious onyx, amethyst, jet, and garnet stones. The Arts and Crafts era (1894-1923) was mostly influenced by the development of earrings and other jewellery created with uncut stones, giving great shape, colour, quality, and unique styled earrings that are both very expensive and difficult to find today. The next era is known as the Edwardian era, which drew a heavy focus on very expensive precious stones such as emeralds, diamonds, and rubies. The majority of these pieces, including earrings, were based on classical ideas and designs, sometimes including a “naturalistic” style. Between the 1900’s and the 1960’s some of the most naturalistic, American, and modern influenced jewellery was created. These many popular styles and designs were made of expensive diamonds and other precious stones. From the Art Nouveau to the Art Deco era (1895-1935), naturalistic designs and influence by Edwardian artists increased dramatically, in turn paving the way for both more representationally influenced and abstract designed earrings and jewellery. In the early 1900’s through the late 1990’s Art Deco gave way to more geometrically popular designs, including American, Oriental, and African influenced designs. The last era, the Retro Era is arguably the most modern, as it began to be influenced by the world of theatre, public entertainment, and royalty. The retro era and style brought with it the fads of jumbo-like rings, earrings, and other jewellery known or now sold under the category of “vintage jewellery”.